I teach children’s literature, write books about children’s literature, and direct a graduate program in children’s literature. But I’ve never taken a single course in children’s literature, neither as a graduate student nor as an undergraduate student. I have no formal training in the field of my alleged expertise. Children’s literature is the reason that I became an English Ph.D., but I did not realize that until well after I earned the degree. Children’s literature made me a reader. Since I liked reading, I became an English major. Realizing, as a college junior, that reading books and writing papers was far more appealing than seeking a “real job,” I applied to graduate programs in English. Though I enjoyed writing an honors thesis on William Faulkner, the books of early childhood were more important: they instilled in me a love of reading. So, don’t blame The Sound and the Fury. Blame Crockett Johnson’s Harold and the Purple Crayon, Jeff Brown’s Flat Stanley, Judy Blume’s Tales of a Fourth-Grade Nothing, and Dr. Seuss’s Green Eggs and Ham. A chapter of my dissertation was on Dr. Seuss. That chapter — “Dada Knows Best: Growing Up ‘Surreal’ with Dr. Seuss” — became my first conference paper (1997) and, in its revised form, my first published article (1999).2 Until I wrote that chapter, I had not been aware that one could do scholarly work on children’s literature. Vanderbilt University’s Department of English did not (and, as far as I know, still does not) offer courses in the subject. The late Nancy Walker had done some work on children’s literature, but I was unaware of this fact until after I received the Ph.D. Though there are more opportunities for graduate study in children’s literature now, many of us in the field are autodidacts. Appropriate, perhaps, that the book that inspired me to take children’s literature seriously was written by two non-experts: Judith and Neil Morgan’s Dr. Seuss and Mr. Geisel: A Biography (1995). Before reading it, I hadn’t known that Dr. Seuss was a political cartoonist. Or that, during World War II, he’d worked with Chuck Jones on the Private SNAFU cartoons. Fascinating stuff. My move into children’s literature began by chance, but became pragmatic. The Seuss chapter was the only part of the dissertation on children’s literature. The book version, The Avant-Garde and American Postmodernity: Small Incisive Shocks (2002), included a second children’s lit chapter (on Chris Van Allsburg). The other chapters were on (mostly) American literature and music for grown-ups: Nathanael West, Djuna Barnes, Donald Barthelme, Don DeLillo, Laurie Anderson, Leonard Cohen. When I got the degree, I thought I was a twentieth-century Americanist. But I couldn’t get the time of day as a twentieth-century Americanist, much less an MLA interview. So, I reasoned, if I market myself as both a twentieth-century Americanist and a Children’s Lit specialist, then I ought to increase my odds of finding that elusive academic gig. This decision to publish and present in both fields seemed to help. Two years after receiving the degree, I had my first MLA interviews: two in children’s literature, and one for teaching with technology (I’ve had a website since 1997). Though I then only had one refereed article on children’s literature (“Dada Knows Best”), that piece plus two other under-consideration children’s literature essays — one a new Seuss essay, and the other on Crockett Johnson — proved persuasive enough to get me one campus visit. I used the Crockett Johnson piece for the job talk, and spoke of my plan to write a biography of Johnson. The combination of my slender publication record, plans for future projects — coupled, of course, with a native ability to bluff — worked. During that hiring cycle (1999-2000), I finally landed a tenure-track job … at the university where I still teach today. For a time, I thought I would remain active in both fields. 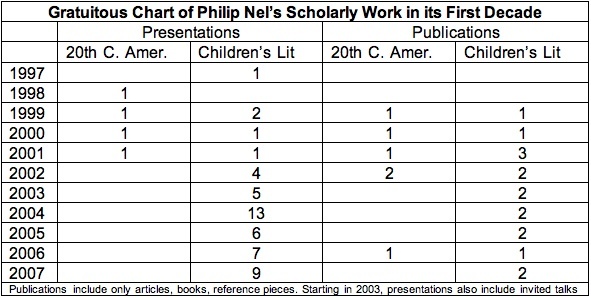 But, as the chart below indicates, it proved impossible to keep up in both children’s literature and twentieth-century/contemporary American literature. I taught my last “20th-Century American” class (a seminar on Don DeLillo) in 2001. Although I continue to venture beyond books for young readers, first and foremost I am a scholar of children’s literature. It’s taken some time for me to become comfortable making such a claim. I am a scholar of children’s literature, but I am also keenly aware of how much I don’t know about children’s literature. On the one hand, this can be a source of anxiety (Aaah! I’m unqualified!). On the other, it can be a source of inspiration (Hooray! So much to discover!). Though I’m more inspired than anxious, one hazard of autodidacticism is acute consciousness of one’s status as disciplinary outsider. Since I never studied it formally, I’m not always sure what I should have mastered by now; since the field is so vast, I know I’ll never master it all. Happily, one benefit of graduate school is learning how to learn. So, I read the relevant scholarly books and articles, regularly attend the children’s literature conferences,3 and read lots of children’s books — which, after all, is the reason I chose this line of work in the first place. 1. Talking Heads, “Once in a Lifetime,” Remain in Light (Sire/Warner Bros., 1980). 2. The conference: Second Biennial Conference on Modern Critical Approaches to Children’s Literature, Nashville, TN, 11 April 1997. The publication: Children’s Literature 27 (1999): 150-184. 3. I go to the Children’s Literature Association, and the International Research Society for Children’s Literature. The former is the big North American one (ChLA is international, but most members are from the U.S. or Canada); the latter is the big international one. There are others, of course — regional ones, and ones that develop from other disciplines, such as Library Science or Education. So, look around and find the ones that intrigue you the most. Note: You can also read this essay on the Children’s Literature Association’s “Scholarly Resources” page — scroll down to “Pursuing a Degree in Children’s Literature” (the items are in alphabetical order). There, you will also find a great autobiographical essay by Marah Gubar. Its title? “All That David Copperfield Kind of Crap.” Check it out! Phil, thanks for sharing your story. I found much here that resonated with my own experiences. As I begin to think through and plan my early career research agenda this fall, I’ll return to this piece again and again. All the best! That is actually a companion to how I got to be a children’s book writer! I took a 20th Century American class and a Shakespeare class from you. Those would have been in 2000-2001. But I’ve followed your career with interest because of our shared enthusiasm for children’s literature. I’m glad you found your place in the field, Phil! Thank you all for your comments! Jane: If you’ve published the account of how you came to be a children’s book writer, I’d love to read it… as, I expect, would many others! Have you? Ebony: Kind of you to say so. If anything here seems useful, that’s good! Anne: Glad you enjoyed the 20th-Century American class. I enjoyed having you as a student. I suspect that, for the Shakespeare class, you’re conflating me with Don Hedrick… since I’ve never taught a Shakespeare class. I’m flattered, of course, to be aligned (in your memory) with him, but I want to publicly make sure (here, on this blog) that he gets the credit! I spent my high school and college years reading anything and everything I could get my hands on (usually gotten legally). I found myself drawn to children’s literature because the writing I encountered was so visual and emotional and immediate (adult fiction at the time seemed oddly abstract and distant). Great hearing your story, Philip, and, yes, it’s wonderful that there is so much more to read and learn. A lifetime’s worth. Phil, there are two trends that I see in English Studies that may be resulting in the production of many autodidacts, even if these individuals remain scholars in “established” fields. First, due to budget cuts, many universities are cutting down on the number and the scope of graduate course requirements; as such, students may experience more survey-type courses in their fields or they many experience courses that are hyper-specialized, depending upon the critical orientation of their faculty. Thus, even if a typical doc candidates were focusing on 19th-century American literature, she might only take 2 or 3 courses in her field, as compared to the 4-7 courses that our generation were expected to complete (at least those of us in large programs with 50+ faculty). Second, many universities are viewing the PhD qualifying exams as a clearer pathway to the diss (spurred sometimes by pedagogical reasons and sometimes by budgetary reasons), so that students are reading narrowly defined lists that serve as funnels into their dissertation prospectus. I’ve seen this shift at many, many programs, and a good number of my former mentees report that their exam process was much narrower than the one I had told them they would experience when they pursued doctoral work. With fewer faculty members mentoring more students…and with fewer replacement hires for faculty who retire or move on, many programs are “downsizing” the course work and exam work for students, who find themselves doing more with less. And that means that more of our students will be teaching themselves in order to fill in the gaps.